The idea behind “Mémoires” was to completely re-record some songs from the first 4 albums, mostly from the first two. In this compilation it’s again Astaroth Merc who recorded everything, like he did in the original albums. 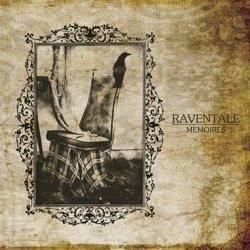 Raventale is a very interesting project and I liked all their works so far. They play atmospheric black metal with some doom metal elements and they have a very personal style, distinct in each of their works. Their music is based mostly in the wonderful guitars, which have a very deep, emotional and melancholic sound, accompanied by beautiful atmospheric synths when needed. Vocals are in the brutal side, between black and death metal screams, changing often from album to album. Their songs move in slow and mid tempos, with only few faster parts. They have a suffocating, almost mourn-like mood, depressive and warm at the same time. Astaroth has a great talent in composing music with “simple” means. There are not many changes and “surprises” inside the songs and he manages to use ”repetition” in favor of the enchanting atmosphere of his music. He is walking in a thin line, playing with a very fragile balance, but he succeeds and his songs never sound boring. On the contrary his long compositions can easily drag you inside their unique atmosphere, from which you don’t want to escape… The band improved its sound with each release and I found the idea of this compilation a very good way to introduce someone to their music, giving a fresh breath to these wonderful compositions. While there are not many differences from the original songs, still this re-recording adds a lot to the album, giving it a modern solid sound, with a more professional production and a common atmosphere. The biggest difference is in the vocals, which are much better now and in my opinion the best the band ever had! “Mémoires” includes 10 re-recorded old songs plus a new track, the short instrumental “Requiem F.D.” and the total album playtime is over 67 minutes. Lyrics are some of them in English and the others in Russian, included in the CD booklet. I am not the biggest fan of compilations in general, but this is a quite different case, since you actually get new recordings. If you don’t have any of their early works, “Mémoires” is a good way to discover the band. If you already have them, this album is still interesting, since you refresh your memories with all these great songs, but this time presented with Raventale’s current sound. ”Mémoires” is released by Satanath Records and Dark East Productions in a limited to 500 copies edition CD. The first 100 copies come in 4-panel digipak and the rest of them in standard jewel-case edition, both of them including a 12-page booklet. Every 10th disc includes a special magnet. All artwork is by Astaroth himself. You can visit the band’s official profiles below and listen to its complete discography.